Definition - What does Wheel Pose mean? Wheel pose is a relatively challenging back-bending yoga posture. The front of the body is pressed upwards and the spine is arched backwards with the hands and the feet on the ground. This posture can be entered from a supine position or, for more advanced practitioners, by “dropping back” from standing. Entering the pose fully requires strength in the arms, legs and back as well as flexibility in the shoulders, spine and quads. The Sanskrit name for wheel pose is chakrasana. Wheel pose takes its name from the rounded shape of the body in the pose. In this posture, the front of the body is powerfully stretched. It helps to strengthen the muscles of the arms, shoulders and thighs. It also improves the flexibility of the shoulders, spine and hip flexors. Wheel pose, like all backbends, is believed to increase your energy levels and counteract depression. It is useful for anyone who works at a desk or a computer as it reverses the characteristic hunched posture of desk work. 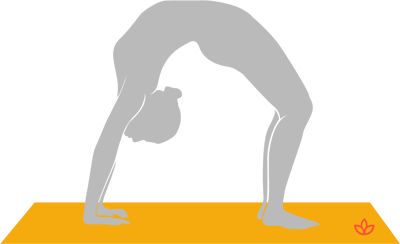 A less challenging variation is bridge pose, where the hips are lifted, but the shoulders and arms remain on the floor. The posture can also be made more advanced by raising one arm or leg.